Northern Tablelands MP Adam Marshall, left, Research Scientist Carol Harris and District Veterinarian Nigel Brown during a tour of one of the dated glasshouses at the Glen Innes Research Station yesterday. 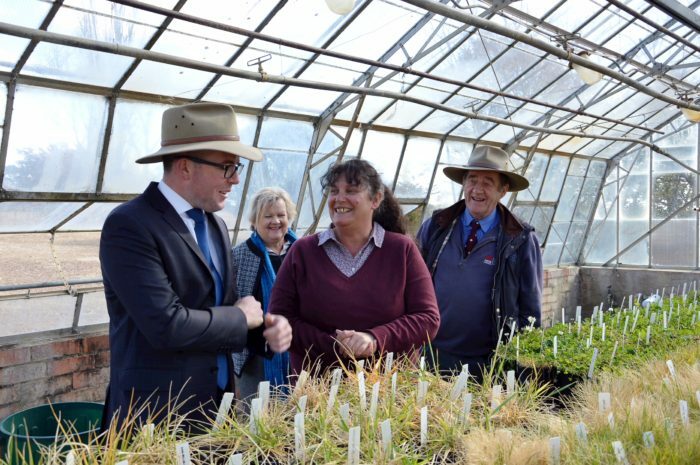 NORTHERN Tablelands MP Adam Marshall has toured the Glen Innes Agricultural Research Station to see at first hand just how last week’s $2.1 million NSW Budget boost will help the centre extend glasshouse facilities for more advanced pasture research. Mr Marshall said the Glen Innes investment would substantially add to the research station’s capacity to play an integral part in bolstering on-farm productivity. He added the construction of state-of-the-art glasshouses would include climate control functions to conduct future research experiments and trials. “This is vitally important for our farmers and graziers to keep ahead of the global agricultural industry and it is critical that our northern research plays a big part in that overall R&D push,” Mr Marshall said. “The current glasshouses date back to the 1960s and while they can grow plants for basic experiments, there is no climatic control functions – so this will provide for a giant step in their research capability, and bolster research that takes account of changing climatic conditions. “They will be able to do temperature experiments into tropical pastures and the different environmental effects of those. The Glen Innes Ag Station dates back to 1902, is on a 1,000 acre property and is a critical research facility with about a dozen fulltime staff, including Department of Primary Industries, Water NSW and Local Land Services, based there. During the tour, Mr Marshall met and spoke with research scientist Carol Harris who is leading vital trials in pastures, including into Chilean Needle Grass. “Chilean Needle Grass is a major weed problem on the Northern Tablelands but critically it has potential for a wider range and distribution,” Mr Marshall said. Mrs Harris told the MP that part of the Needle Grass research included looking at alternative measures to chemical control, including examining whether essential oils could play a wider role as a growth inhibitor with preliminary results so far encouraging. “The new glasshouse will give research scientists at Glen Innes a new focus on detailed studies and complement what they are doing in the field,” Mr Marshall said. “At a time when Northern Tablelands farmers are dealing with a cold, dry winter it is encouraging to see the NSW Government continue to back our farmers by investing in the future of agriculture,” he said. The NSW Department of Primary Industries is ranked in the top one per cent of research organisations globally in the fields of agricultural and plant and animal science.